Yeah, I’ve come around. See, I’ll be real frank here… I used to seriously dislike Harley’s. Just like a really disliked Ruger. But when I sat back and was honest and objective about what Ruger was doing these days… I had to admit that I liked what they were doing, where they were heading and pretty soon I had to admit that I liked Ruger. I’m a Ruger fan now. My opinion can and has changed before, so this is no shock. I reserve the right to change my opinion when new information comes to light or the situation has changed. Ruger changed, and thus so did my opinion. Harley has done the same thing to me. 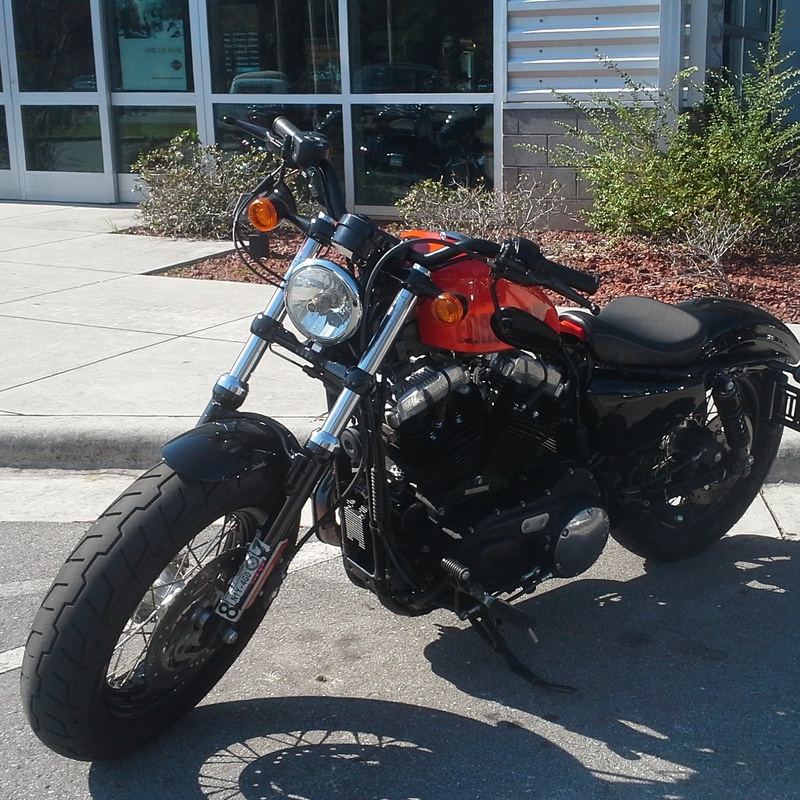 For some time I’ve admitted that I really dig the looks of the Iron 883 and the Forty Eights. In fact, I snapped this photo on my phone and have kept it for about a year now. This bike speaks to me, visually. The other Harley I am digging… The Breakout. This is Harley’s factory bad boy… Fattest rear tire they’ve ever put on a production bike. Stretched out forks, big front wheel, chopped fenders… it’s a low, lean, angry looking bike. I like that. And I normally don’t dig the Low and Lean look on bikes like this. But here, I just love it. Why did I change my tune on Harley’s? Maybe it was the Project Livewire test ride I took. That opened my eyes on what Harley Davidson is truly capable of and it was as shocking to me as an Ice Bucket Challenge. Everything I thought I knew about HD was suddenly ripped away and replaced with an understanding that I knew nothing, John Snow. Since then, I’ve been looking, and learning, and have come to an understanding. The other thing that changed my opinion… Harley Davidson of Charlotte. Super cool people there. Gun people, so I can relate… But they were all friendly, genuine, good people. Typical of most Motorcycle people I know… typical of folks from The South… So that Southern Rider vibe you could call it. I’ll call it that. Honestly, it’s one of the very few Motorcycle Dealerships that I’ve ever felt at home at. Let’s put it this way – if I could afford to buy a motorcycle right now, it would be a Harley, and it would be from Harley of Charlotte. The only problem though is which one would I get? Man, I love that Breakout. But that simple “48” just does it for me. Now, if I could get that “48” with the 103 Engine… THAT would be it. Well, really the only downside to the 48 is the 2 gallon fuel tank. If they made a tank that looked just like that Peanut Tank, but held 4 gallons… There we go. With that 103…. 4 gallons and a 103… that would be my ticket. You will get bored on a Harley. I have seen you ride. I’m willing to risk it. cut my teeth on metric sportbikes. and Harley D best fits the bill. but i still like a little performance bite with my bark. and HD keeps doing things to muck it up. granted they try some cool stuff, like Livewire… and Buell. first they bought Buell (!! ), came out with some really great American sportbikes… and then killed it off. then they came out with the XR1200… and then killed it off. i really WANT to like Harley… but what gives??? They just got a new CEO, so it’s going to be very interesting. I take back everything- wait no, half the bad things I said about HD. at least they are reviving the 883 roadster for the US market in 2016. seriously tempted to ante up for one. The Fat Bob is the object of my desire. I’ve ridden a bunch of HD’s now… And I just love the Fat Bob.